What follows is the 7th of eight disaster lessons from site. We ask what went wrong and review what we’ve changed in our practices to prevent it from happening again. An archive of the series can be accessed here. The project was nearing practical completion. Problems with the timber benchtops prior to their arrival on site meant however that they had been rejected by the builder. A new fabricator still had to be found, but the clients had outstayed their welcome at their rental property and needed to retake possession as soon as possible. A compromise was reached therefore where the builder installed temporary melamine benchtops, allowing the clients to move in and a solution for the benchtops be found without time pressure. Perhaps inevitably, the absence of time pressure meant an absence in urgency. Every step in finding alternatives for the fabricator, material and details was made more difficult and less timely by the lack of regular site meetings. Instead of weekly opportunities to make the necessary decisions together, we had to resort to emails and phone conversations in isolation. We would propose a particular timber to the clients via phone, who would then respond with approval via email, which we would then action by ordering samples, which we would show to the client in a meeting the builder was unable to attend, whom we would then instruct via email, who would obtain a quote, which would require further clarification, which we would need to assess, and then issue to the clients, who would change their mind. It was an endless and almost impossible cycle. The clients were in no hurry to resolve the benchtops because they were already living in the house with functional (if inelegant) stand-ins. Neither we nor the builder were in a hurry because we no longer had a real deadline to spur us on. Maintaining momentum on the project without either a deadline or regular contact with the site and each other was much easier said than done. It became clear how important a milestone practical completion is. In addition to all the contractual and financial implications, it marks two important transitions: first, occupation of the site transfers from builder to client. There is a tacit exchange in responsibility for its wellbeing, making it harder for the builder to go through the necessary mental steps to do work on it. Second, everyone begins to move on with their lives. The clients stop objectifying their house and begin just living in it; and both we and the builder transfer our attention to other projects. So the lesson is a simple one, if potentially a little hard to bear: we must do everything in our power to discourage client possession prior to completion of the construction works. 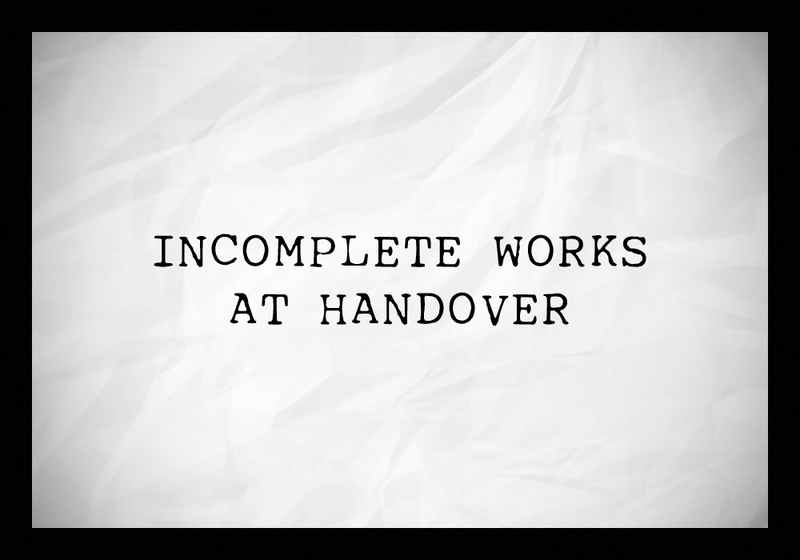 Incomplete works at handover, author’s own image.